Here's our Fortnite guide on how to complete all the tasks for Week 8 of Season 7 in Battle Royale. We’re now well into the latter half of Fortnite Season 7, but the challenges keep on coming as usual. In our Fortnite Week 8 Challenges guide, we’ll be walking you through the complete list of all the brand new challenges arriving in Battle Royale for this week. For a complete recap of all the additional challenges that have taken place so far this season, head over to our Fortnite Season 7 guide. Alternatively, you can check out our main Fortnite guide hub, where we list out some of the essential tips that every Battle Royale player should know. Just below, you can see a complete outline of all the challenges that have been added to the game as of January 24. 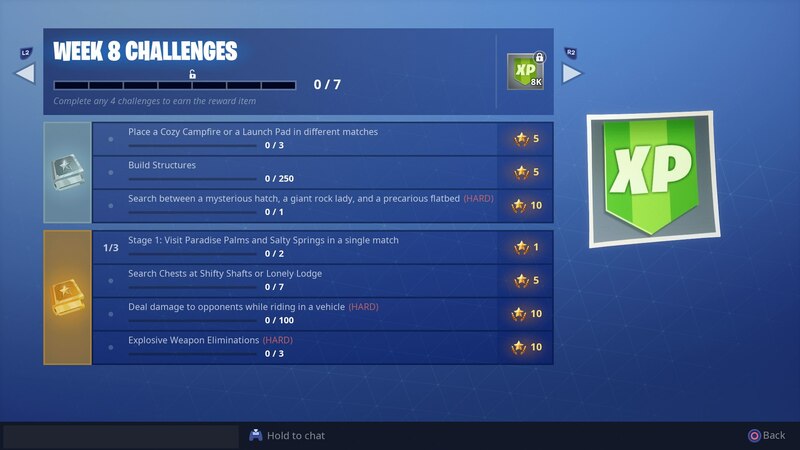 As always, the first three of these challenges are free for all Fortnite Battle Royale players to complete, while the latter four are available to Battle Pass holders only. Place a Cozy Campfire or a Launch Pad in different matches (3). Search between a mysterious hatch , a giant rock lady, and a precarious flatbed. Stage 1: Visit Paradise Palms and Salty Springs in a single match. Search chests at Shifty Shafts or Lonely Lodge (7). Deal damage to opponents while riding in a vehicle (1000). And that’s all the information you need to complete the new batch of challenges in Fortnite Season 7. If you need help completing the previous week’s challenges, head over to our Fortnite Week 7 Challenges guide. Avenge the fallen in Fortnite's upcoming crossover event.